The Southeast’s climate is influenced by many factors, including latitude, topography, and proximity to the Atlantic Ocean and the Gulf of Mexico. Temperatures generally decrease northward and into mountain areas, while precipitation decreases with distance from the Gulf and Atlantic coasts. The region’s climate also varies considerably over seasons, years, and decades, largely due to natural cycles such as the El Niño-Southern Oscillation (ENSO – periodic changes in ocean surface temperatures in the Tropical Pacific Ocean), the semi-permanent high pressure system over Bermuda, differences in atmospheric pressure over key areas of the globe, and landfalling tropical weather systems.99,100,101,102,103 These cycles alter the occurrences of hurricanes, tornadoes, droughts, flooding, freezing winters, and ice storms, contributing to climate and weather disasters in the region that have exceeded the total number of billion dollar disasters experienced in all other regions of the country combined (see Figure 17.1). Climate change impacts, especially sea level rise and related increases in storm surges pulsing farther inland, will continue to exacerbate ongoing land loss already affecting Louisiana tribes. Four Native communities in Southeast Louisiana (Grand Bayou Village, Grand Caillou/Dulac, Isle de Jean Charles, and Pointe-au-Chien) have already experienced significant land loss. Management of river flow has deprived the coastal wetlands of the freshwater and sediment that they need to replenish and persist. Dredging of canals through marshes for oil and gas exploration and pipelines has led to erosion and intense saltwater intrusion, resulting in additional land loss. Due to these and other natural and man-made problems, Louisiana has lost 1,880 square miles of land in the last 80 years.13 This combination of changes has resulted in a cascade of losses of sacred places, healing plants, habitat for important wildlife, food security,104 and in some cases connectivity with the mainland. Additional impacts include increased inundation of native lands, further travel to reach traditional fishing grounds, reduced connections among family members as their lands have become more flood-prone and some have had to move, and declining community cohesiveness as heat requires more indoor time.79 (For more specifics, see Ch. 12: Indigenous Peoples). Numerous other impacts from increases in temperature, sea level rise, land loss, erosion, subsidence, and saltwater intrusion amplify these existing problems. Figure 17.2: Aerial photos of Isle de Jean Charles in Louisiana taken 45 years apart shows evidence of the effects of rising seas, sinking land, and human development. The wetlands adjacent to the Isle de Jean Charles community (about 60 miles south of New Orleans) have been disappearing rapidly since the photo on the left was taken in 1963. By 2008, after four major hurricanes, significant erosion, and alteration of the surrounding marsh for oil and gas extraction, open water surrounds the greatly reduced dry land. See Ch. 25: Coasts for more information. (Photo credit: USGS). Average annual temperature during the last century across the Southeast cycled between warm and cool periods (see Figure 17.3, black line). A warm peak occurred during the 1930s and 1940s followed by a cool period in the 1960s and 1970s. Temperatures increased again from 1970 to the present by an average of 2°F, with higher average temperatures during summer months. Figure 17.3: Observed annual average temperature for the Southeast and projected temperatures assuming substantial emissions reductions (lower emissions, B1) and assuming continued growth in emissions (higher emissions, A2).1 For each emissions scenario, shading shows the range of projections and the line shows a central estimate. The projections were referenced to observed temperatures for the period 1901-1960. The region warmed during the early part of last century, cooled for a few decades, and is now warming again. The lack of an overall upward trend over the entire period of 1900-2012 is unusual compared to the rest of the U.S. and the globe. This feature has been dubbed the “warming hole” and has been the subject of considerable research, although a conclusive cause has not been identified. (Figure source: adapted from Kunkel et al. 20131). There have been increasing numbers of days above 95°F and nights above 75°F, and decreasing numbers of extremely cold days since 1970.1 The Caribbean also exhibits a trend since the 1950s, with increasing numbers of very warm days and nights, and with daytime maximum temperatures above 90°F and nights above 75°F.2 Daily and five-day rainfall intensities have also increased.3 Also, summers have been either increasingly dry or extremely wet.1 For the Caribbean, precipitation trends are unclear, with some regions experiencing smaller annual amounts of rainfall and some increasing amounts.2 Although the number of major tornadoes has increased over the last 50 years, there is no statistically significant trend (Ch 2: Our Changing Climate, Key Message 9).1,4 This increase may be attributable to better reporting of tornadoes. The number of Category 4 and 5 hurricanes in the Atlantic basin has increased substantially since the early 1980s compared to the historical record that dates back to the mid-1880s (Ch. 2: Our Changing Climate, Key Message 8). This can be attributed to both natural variability and climate change. Projections of future precipitation patterns are less certain than projections for temperature increases.1 Because the Southeast is located in the transition zone between projected wetter conditions to the north and drier conditions to the southwest, many of the model projections show only small changes relative to natural variations. However, many models do project drier conditions in the far southwest of the region and wetter conditions in the far northeast of the region, consistent with the larger continental-scale pattern of wetness and dryness (Ch. 2: Our Changing Climate, Key Message 5).1 For the Caribbean, it is equally difficult to project the magnitude of precipitation changes, although the majority of models show future decreases in precipitation are likely, with a few areas showing increases. In general, annual average decreases are likely to be spread across the entire region.2 Projections further suggest that warming will cause tropical storms to be fewer in number globally, but stronger in force, with more Category 4 and 5 storms (Ch. 2: Our Changing Climate, Key Message 8).5 On top of the large increases in extreme precipitation observed during last century and early this century (Ch. 2: Our Changing Climate, Figures 2.16, 2.17, and 2.18), substantial further increases are projected as this century progresses (Ch. 2: Our Changing Climate, Figure 2.19). A central component of the process was the Southeast Regional Climate Assessment Workshop that was held on September 26-27, 2011, in Atlanta, with approximately 75 attendees. This workshop began the process leading to a foundational Technical Input Report (TIR). That 341-page foundational “Southeast Region Technical Report to the National Climate Assessment”3 comprised 14 chapters from over 100 authors, including all levels of government, non-governmental organizations, and business. The writing team held a 2-day meeting in April 2012 in Ft. Lauderdale, engaged in multiple teleconference and webinar technical discussions, which included careful review of the foundational TIR,3 nearly 60 additional technical inputs provided by the public, and other published literature and professional judgment. Discussions were followed by expert deliberation of draft key messages by the authors, and targeted consultation with additional experts by the Southeast chapter writing team and lead author of each key message. The key message and supporting text summarize extensive evidence documented in the Southeast Technical Input Report.3 A total of 57 technical inputs on a wide range of southeast-relevant topics (including sea level rise) were also received and reviewed as part of the Federal Register Notice solicitation for public input. 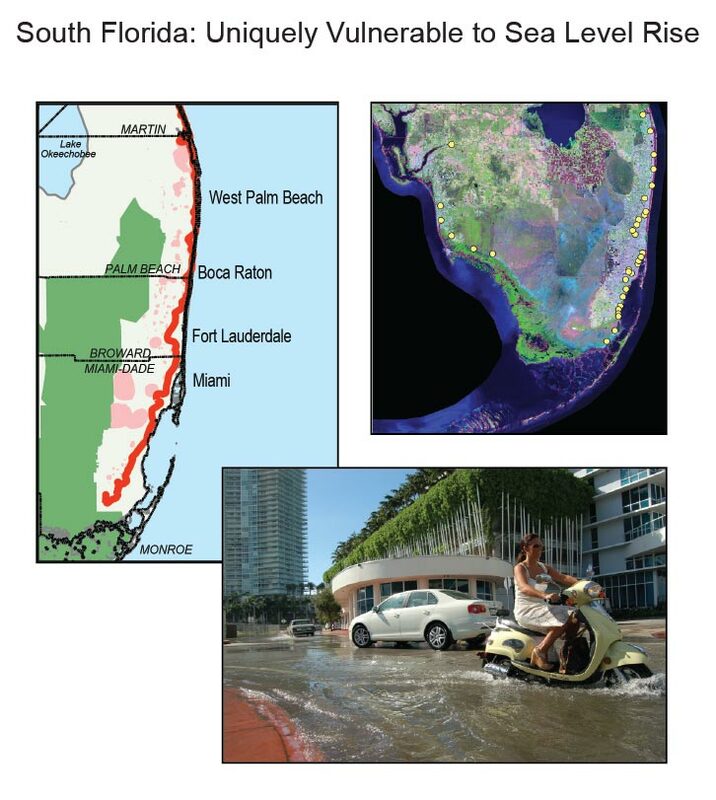 Evidence that sea level rise is a threat to natural and human environments is documented in detail within the foundational TIR3 and other technical inputs, as well as considerable peer-reviewed literature (for example, Campanella 2010).7 Field studies document examples of areas that are being flooded more regularly, saltwater intrusion into fresh water wells,8 and changes from fresh to saltwater in coastal ecosystems (for example, freshwater marshes) causing them to die,9 and increases in vulnerability of many communities to coastal erosion. Economic impacts are seen in the cost to avoid flooded roads, buildings, and ports;10 the need to drill new fresh water wells;8 and the loss of coastal ecosystems and their storm surge protection. Uncertainties in the rate of sea level rise through this century stems from a combination of large differences in projections among different climate models, natural climate variability, uncertainties in the melting of land-based glaciers and the Antarctic and Greenland ice sheets especially, and uncertainties about future rates of fossil fuel emissions. A further key uncertainty is the rate of vertical land movement at specific locations. The two factors – sea level rise and subsidence – when combined, increase the impact of global sea level rise in any specific area. 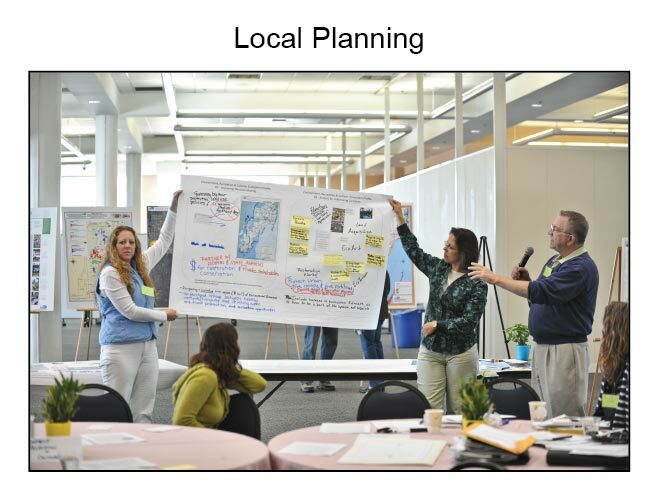 A third area of uncertainty is where and what adaptive plans and actions are being undertaken to avoid flooding and associated impacts on people, communities, facilities, infrastructure, and ecosystems. Sea level is expected to continue to rise for several centuries, even if greenhouse gas emissions are stabilized, due to the time it takes for the ocean to absorb heat energy from the atmosphere. Because sea levels determine the locations of human activities and ecosystems along the coasts, increases in sea level and in the rate of rise will nearly certainly have substantial impacts on natural and human systems along the coastal area. What specific locations will be impacted under what specific levels of sea level rise needs to be determined location-by-location. However, given that many locations are already being affected by rising seas, more and more locations will be impacted as sea levels continue to rise. Confidence in this key message is therefore judged to be very high. There is an imminent threat of increased inland flooding during heavy rain events in low-lying coastal areas such as southeast Florida, where just inches of sea level rise will impair the capacity of stormwater drainage systems to empty into the ocean.23 Drainage problems are already being experienced in many locations during seasonal high tides, heavy rains, and storm surge events. Adaptation options that are being assessed in this region include the redesign and improvement of storm drainage canals, flood control structures, and stormwater pumps. Ecosystems of the Southeast and Caribbean are exposed to and at risk from sea level rise, especially tidal marshes and swamps. Some tidal freshwater forests are already retreating, while mangrove forests (adapted to coastal conditions) are expanding landward.28 The pace of sea level rise will increasingly lead to inundation of coastal wetlands in the region. 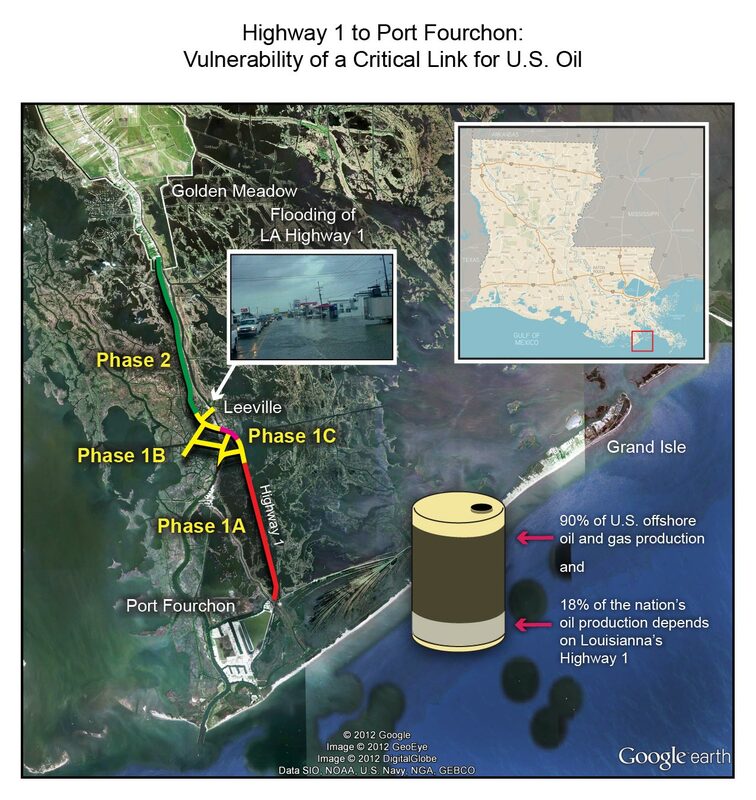 Such a crisis in land loss has occurred in coastal Louisiana for several decades, with 1,880 square miles having been lost since the 1930s as a result of natural and man-made factors.13,29 With tidal wetland loss, protection of coastal lands and people against storm surge will be compromised. 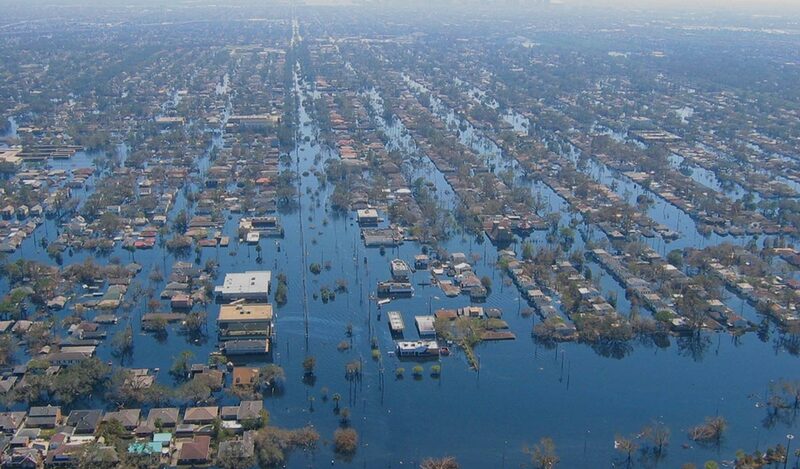 Homes and infrastructure in low-lying areas are increasingly vulnerable to flooding due to storm surge as sea level rises. Reduction of wetlands also increases the potential for losses of important fishery habitat. Additionally, ocean warming could support shifts in local species composition, invasive or new locally viable species, changes in species growth rates, shifts in migratory patterns or dates, and alterations to spawning seasons.2,30 Any of these could affect the local or regional seafood output and thus the local economy. The impacts of sea level rise on agriculture derive from decreased freshwater availability, land loss, and saltwater intrusion. Saltwater intrusion is projected to reduce the availability of fresh surface and groundwater for irrigation, thereby limiting crop production in some areas.33 Agricultural areas around Miami-Dade County and southern Louisiana with shallow groundwater tables are at risk of increased inundation and future loss of cropland with a projected loss of 37,500 acres in Florida with a 27-inch sea level rise,34 which is well within the 1- to 4-foot range of sea level rise projected by 2100 (Ch. 2: Our Changing Climate, Key Message 10). The key message and supporting text summarize extensive evidence documented in the Southeast Technical Input Report.3 Technical inputs (57) on a wide range of topics were also received and reviewed as part of the Federal Register Notice solicitation for public input. Numerous peer-reviewed publications describe increasing hazards associated with heat events and rising temperatures for the Southeast. 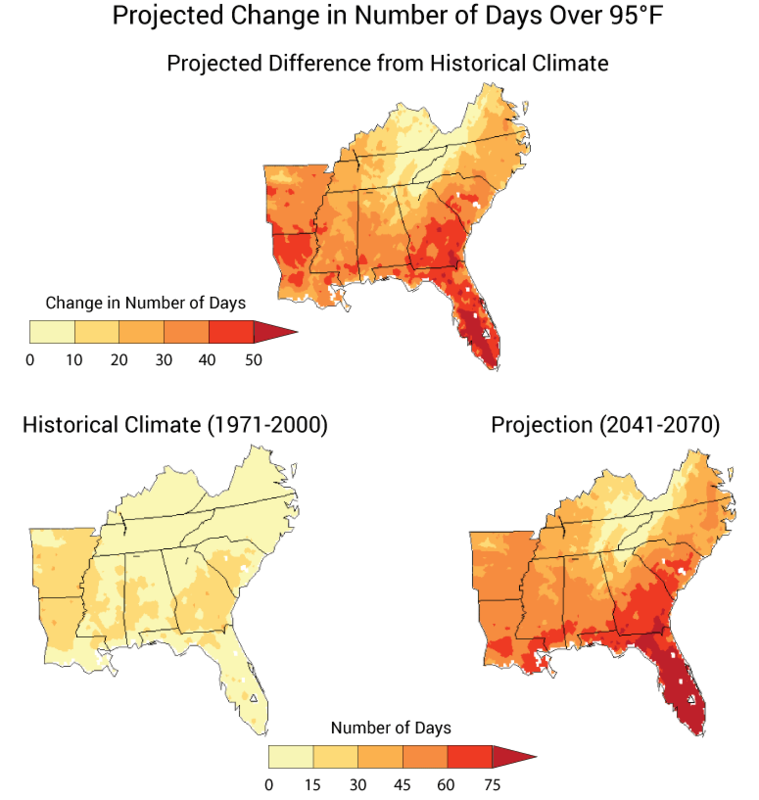 The authors of a report on the Southeast climate1 worked closely with the region’s state climatologists on both the climatology and projections for temperature and associated heat events. Evidence of rising temperatures and current impacts36,37,38 is based on an extensive set of field measurements. Rising water temperatures also increase risks of bacterial infection from eating Gulf Coast shellfish41 and increase algal blooms that have negative human health effects.42,43,44,45 There is also evidence that there will be an increase in favorable conditions for mosquitoes that carry diseases.46 Higher temperatures are detrimental to natural and urban environments, through increased wildfires in natural areas and managed forests47,48,49,50 and increased invasiveness of some non-native plants.51 High temperatures also contribute to more roadway damage and deformities of transportation infrastructure such as railroad tracks and bridges (Ch. 5: Transportation).52 In addition, high temperatures increase net energy demand and costs, placing more stress on electricity generating plants and distribution infrastructure. Since 2007, studies on impacts of higher temperatures have increased in many areas. Most of the publications cited above concluded that increasing temperatures in the Southeast will result in negative impacts on human health, the natural and built environments, energy, agriculture, and forestry. A key issue (uncertainty) is the detailed mechanistic responses, including adaptive capacities and/or resilience, of natural and built environments, the public health system, energy systems, agriculture, and forests to increasing temperatures and extreme heat events. Another uncertainty is how combinations of stresses, for example lack of water in addition to extreme heat, will affect outcomes. There is a need for more monitoring to document the extent and location of vulnerable areas (natural and human), and then research to assess how those impacts will affect productivity of key food and forest resources and human well-being. There is also a need for research that develops or identifies more resilient, adapted systems. There is high confidence in documentation that projects increases in air temperatures (but not in the precise amount) and associated increases in the frequency, intensity, and duration of extreme heat events. 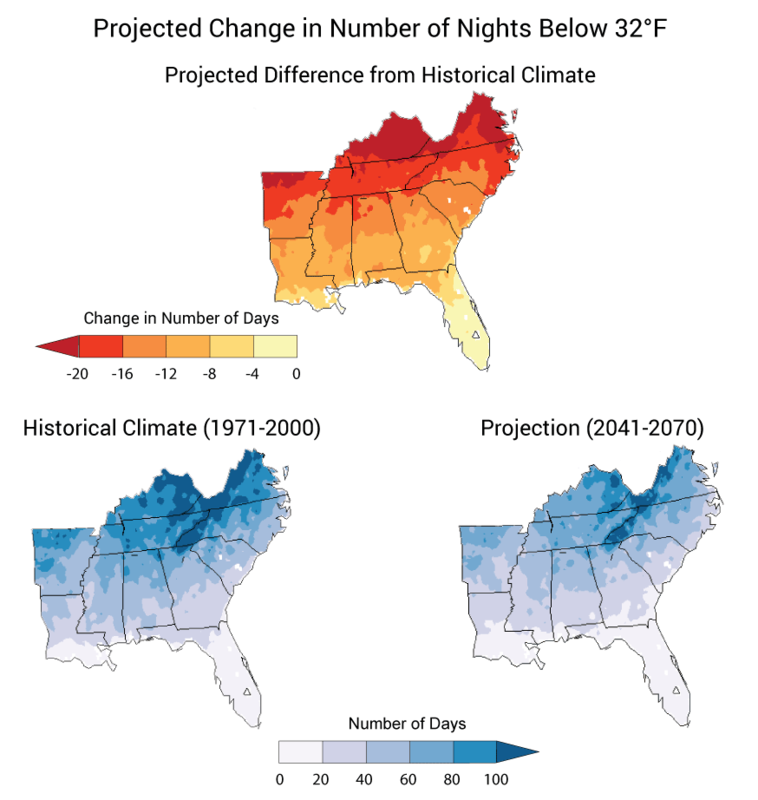 Projections for increases in temperature are more certain in the Southeast than projections of changes in precipitation. Rising temperatures and the substantial increase in duration of high temperatures (for either the low [B1] or high [A2] emissions scenarios) above critical thresholds will have significant impacts on the population, agricultural industries, and ecosystems in the region. There is high confidence in documentation that increases in temperature in the Southeast will result in higher risks of negative impacts on human health, agricultural, and forest production; on natural systems; on the built environment; and on energy demand. 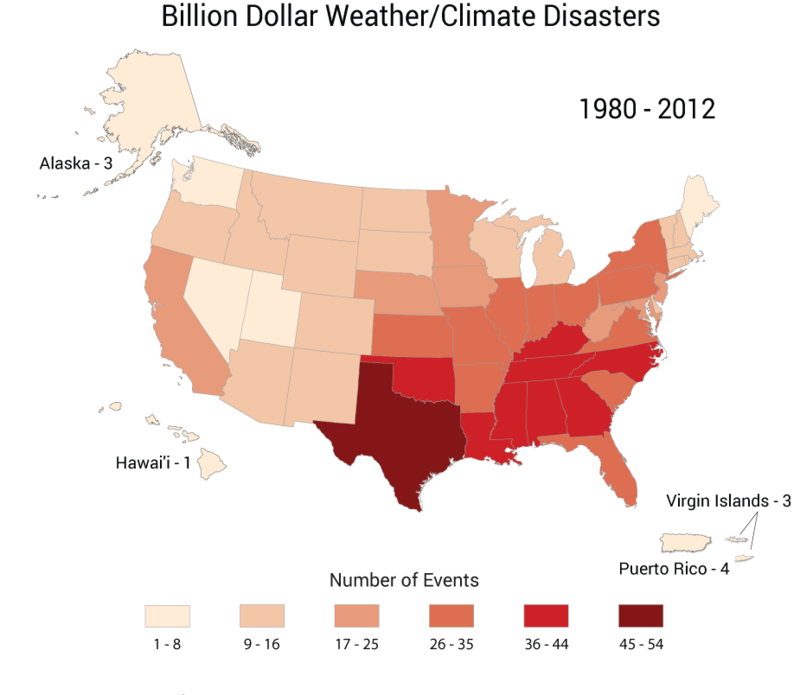 There is lower confidence in the magnitude of these impacts, partly due to lack of information on how these systems will adapt (without human intervention) or be adapted (by people) to higher temperatures, and partly due to the limited knowledge base on the wide diversity that exists across this region in climates and human and natural systems. The southeastern U.S. (data include Texas and Oklahoma, not Puerto Rico) leads the nation in number of wildfires, averaging 45,000 fires per year,47 and this number continues to increase.48,49 Increasing temperatures contribute to increased fire frequency, intensity, and size,47 though at some level of fire frequency, increased fire frequency would lead to decreased fire intensity. Lightning is a frequent initiator of wildfires,71 and the Southeast currently has the greatest frequency of lightning strikes of any region of the country.72 Increasing temperatures and changing atmospheric patterns may affect the number of lightning strikes in the Southeast, which could influence air quality, direct injury, and wildfires.Drought often correlates with large wildfire events, as seen with the Okeefenokee (2007) and Florida fires (1998). The 1998 Florida fires led to losses of more than $600 million.73 Wildfires also affect human health through reduced air quality and direct injuries.73,74,50,75 Expanding population and associated land-use fragmentation will limit the application of prescribed burning, a useful adaptive strategy.49 Growth management could enhance the ability to pursue future adaptive management of forest fuels. Forest disturbances caused by insects and pathogens are altered by climate changes due to factors such as increased tree stress, shifting phenology, and altered insect and pathogen lifecycles.76 Current knowledge provides limited insights into specific impacts on epidemics, associated tree growth and mortality, and economic loss in the Southeast, though the overall extent and virulence of some insects and pathogens have been on the rise (for example, Hemlock Woolly Adelgid in the Southern Appalachians), while recent declines in southern pine beetle (Dendroctonus frontalis Zimmerman) epidemics in Louisiana and East Texas have been attributed to rising temperatures.77 Due to southern forests’ vast size and the high cost of management options, adaptation strategies are limited, except through post-epidemic management responses – for example, sanitation cuts and species replacement. Increasing temperatures will affect many facets of life in the Southeast and Caribbean region. For each impact there could be many possible responses. Many adaptation responses are described in other chapters in this document. For examples, please see the sector chapter of interest and Ch. 28: Adaptation. The key message and supporting text summarize extensive evidence documented in the Southeast Technical Input Report (TIR).3 Technical inputs (57) on a wide range of topics were also received and reviewed as part of the Federal Register Notice solicitation for public input. It is a virtual certainty that population growth in the Southeast will continue in the future and will be accompanied by a significant change in patterns of land use, which is projected to include a larger fraction of urbanized areas, reduced agricultural areas, and reduced forest cover.66 With increasing population and human demand, competition for water among the agriculture, urban, and environment sectors is projected to continue to increase. However, the projected population increases for the lower (B1) versus higher (A2) emissions scenarios differ significantly (33% versus 151%).1 Consequently, the effect of climate change on urban water demand for the lower emissions scenario is projected to be much lower than for that of the higher emissions scenario. Land-use change will also alter the regional hydrology significantly. Unless measures are adopted to increase water storage, availability of freshwater during dry periods will decrease, partly due to drainage and other human activities. Projected increase in temperature will increase evaporation, and in areas (the western part of the region83) where precipitation is projected to decrease in response to climate change, the net amount of water supply for human and environmental uses may decrease significantly. 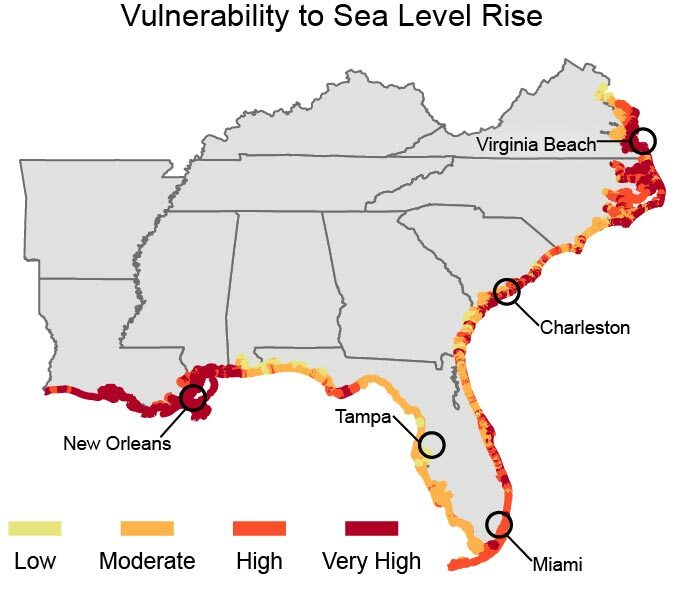 Along the coastline of the Southeast, accelerated intrusion of saltwater due to sea level rise will impact both freshwater well fields and potentially freshwater intakes in rivers and streams connected to the ocean. Although sea level rise (SLR) corresponding to the higher emissions scenario is much higher (twice as much), even the SLR for the lower emissions scenario will increasingly impact water supply availability in low-lying areas of the region, as these areas are already being impacted by SLR and land subsidence. Projections of specific spatial and temporal changes in precipitation in the Southeast remain highly uncertain and it is important to know with a reasonable confidence the sign and the magnitude of this change in various parts of the large Southeast region. 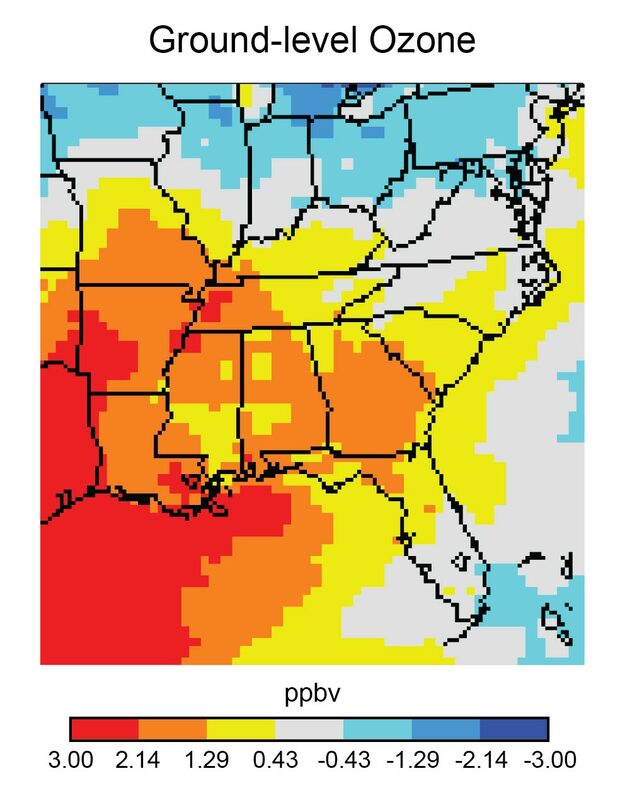 For the Southeast, there are no reliable projections of evapotranspiration, another major factor that determines water yield. This adds to uncertainty about water availability. There are inadequate regional studies at basin scales to determine the future competition for water supply among sectors (urban, agriculture, and environment). There is a need for more accurate information on future changes in drought magnitude and frequency. There is high confidence in each aspect of the key message: it is virtually certain that the water demand for human consumption in the Southeast will increase as a result of population growth. The past evidence of impacts during droughts and the projected changes in drivers (land-use change, population growth, and climate change) suggest that there is a high confidence of the above assessment of future water availability. However, without additional studies, the resilience and the adaptive capacity of the socioeconomic and environmental systems are not known. Water supply is critical for sustainability of the region, particularly in view of increasing population and land-use changes. Climate models’ precipitation projections are uncertain. Nonetheless, the combined effects of possible decreases in precipitation, increasing evaporation losses due to warming, and increasing demands for water due to higher populations (under either lower [B1] or higher [A2] emissions scenarios) will have a significant impact on water availability for all sectors. 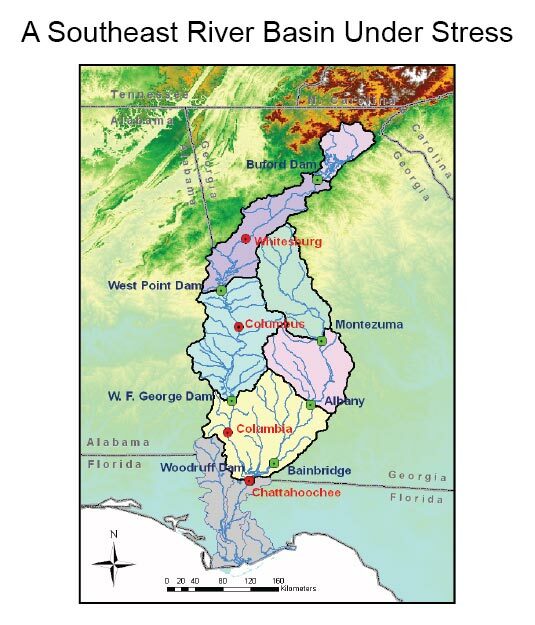 Water resources in the Southeast are abundant and support heavily populated urban areas, rural communities, unique ecosystems, and economies based on agriculture, energy, and tourism. The region also experiences extensive droughts, such as the 2007 drought in Atlanta, Georgia, that created water conflicts among three states.1,87,88,89 In northwestern Puerto Rico, water was rationed for more than 200,000 people during the winter and spring of 1997-1998 because of low reservoir levels.90 Droughts are one of the most frequent climate hazards in the Caribbean, resulting in economic losses.80 Water supply and demand in the Southeast and Caribbean are influenced by many changing factors, including climate (for example, temperature increases that contribute to increased transpiration from plants and evaporation from soils and water bodies), population, and land use.2,3 While change in projected precipitation for this region has high uncertainty (Ch. 2: Our Changing Climate), there is still a reasonable expectation that there will be reduced water availability due to the increased evaporative losses resulting from rising temperatures alone. Because of Clayton County, Georgia’s, innovative water recycling project during the 2007-2008 drought, they were able to maintain reservoirs at near capacity and an abundant supply of water while neighboring Lake Lanier, the water supply for Atlanta, was at record lows. Clayton County developed a series of constructed wetlands used to filter treated water that recharges groundwater and supplies surface reservoirs. They have also implemented efficiency and leak detection programs92 (for additional specific information see the Clayton County Water Authority website at: http://www.ccwa.us/). New freshwater well fields may have to be established inland to replenish water supply lost from existing wells closer to the ocean once they are compromised by saltwater intrusion. Programs to increase water-use efficiency, reuse of wastewater, and water storage capacity are options that can help alleviate water supply stress. The Southeast and Caribbean, which has a disproportionate number of the fastest-growing metropolitan areas in the country and important economic sectors located in low-lying coastal areas, is particularly vulnerable to some of the expected impacts of climate change. The most severe and widespread impacts are likely to be associated with sea level rise and changes in temperature and precipitation, which ultimately affect water availability. Changes in land use and land cover, more rapid in the Southeast and Caribbean than most other areas of the country, often interact with and serve to amplify the effects of climate change on regional ecosystems.